One thing that annoys me no end about Windows is the old sharing violation error. Often you can't identify what's holding it open. Usually it's just an editor or explorer just pointing to a relevant directory but sometimes I've had to resort to rebooting my machine. Any suggestions on how to find the culprit? I've had success with Sysinternals Process Explorer. With this, you can search to find what process(es) have a file open, and you can use it to close the handle(s) if you want. Of course, it is safer to close the whole process. Exercise caution and judgement. To find a specific file, use the menu option Find->Find Handle or DLL... Type in part of the path to the file. The list of processes will appear below. For Windows 7, Windows 8 and Windows 10 you can use the built-in Resource Monitor for this. In case it's not obvious, when you've found the handle, you can identify the process by looking at the Image and/or PID column. You can then close the application if you are able to do that, or just right-click the row and you'll get the option of killing the process right there. Easy peasy! Just be very careful with closing handles; it's even more dangerous than you'd think, because of handle recycling - if you close the file handle, and the program opens something else, that original file handle you closed may be reused for that "something else." And now guess what happens if the program continues, thinking it is working on the file (whose handle you closed), when in fact that file handle is now pointing to something else. Suppose a search index service has a file open for indexing but has gotten stuck temporarily and you want to delete the file, so you (unwisely) force the handle closed. The search index service opens its log file in order to record some information, and the handle to the deleted file is recycled as the handle to the log file. The stuck operation finally completes, and the search index service finally gets around to closing that handle it had open, but it ends up unwittingly closing the log file handle. The search index service opens another file, say a configuration file for writing so it can update some persistent state. The handle for the log file gets recycled as the handle for the configuration file. The search index service wants to log some information, so it writes to its log file. Unfortunately, the log file handle was closed and the handle reused for its configuration file. The logged information goes into the configuration file, corrupting it. Meanwhile, another handle you forced closed was reused as a mutex handle, which is used to help prevent data from being corrupted. When the original file handle is closed, the mutex handle is closed and the protections against data corruption are lost. The longer the service runs, the more corrupted its indexes become. Eventually, somebody notices the index is returning incorrect results. And when you try to restart the service, it fails because its configuration files have been corrupted. You report the problem to the company that makes the search index service and they determine that the index has been corrupted, the log file has mysteriously stopped logging, and the configuration file was overwritten with garbage. Some poor technician is assigned the hopeless task of figuring out why the service corrupts its indexes and configuration files, unaware that the source of the corruption is that you forced a handle closed. I've used Handle with success to find such processes in the past. Lockhunter (http://lockhunter.com/) works on 32 and 64bit systems. Who Lock Me works well and keeps people amused with the name! Just to clarify, this is more likely to be a result of misbehaving 3rd party apps not using the CreateFile API call correctly than it is to be anything in Windows itself. Perhaps it's a consequence of the design of CreateFile, but done is done and we can't go back. Basically when opening a file in a Windows program you have the option to specify a flag that allows shared access. If you don't specify the flag, the program takes exclusive access of the file. Now, if Explorer seems to be the culprit here, it may be the case that that's just on the surface, and that the true culprit is something that installs a shell extension that opens all files in a folder for it's own purposes but is either too gung-ho in doing so, or that doesn't clean up properly after itself. Symantec AV is something I've seen doing this before, and I wouldn't be surprised if other AV programs were also to blame. Source control plug-ins may also be at fault. So not really an answer, but just some advice to not always blame Windows for what may be a badly written 3rd party program (something that can also happen on any other OS which has implicit file locking, but any unix based OS has shared access by default). On a remote server, when you're checking on a network share, something as simple as the Computer Management console can display this information and close the file. Apropos Explorer holding a file open: "When this happens on a file you need to delete, you have the choice of forcing the handle closed, or rebooting." You can just end Explorer. If this is a one-time thing (Explorer does not normally hold this file open) then I would guess logging off and logging back on will do the trick. Otherwise, kill the desktop Explorer process and do what you want while it's gone. First start a copy of cmd.exe (you need a UI to do your intended cleanup). Make sure there are no non-desktop Explorers running. Then kill the last Explorer with, e.g., Task Manager. Do what you want in the command prompt. Finally, run Explorer from the command prompt, and it will become the desktop. I'd guess there may be some residual unpleasantness if some systray programs can't deal with the shell restarting. Files can be locked by local processes (unlocker is the tool to use) and by file access that comes in through shares. There you can even close the file forcefully. There is NirSoft's Opened Files View as well. The above upvoted answers cover situations where a program process is holding the file handle open, which (fortunately) is most of the time - however in some cases (as is occurring on this system at the moment), the system itself holds a file handle open. You can identify this situation by following the instructions to find the file handle holding process with process explorer above, and noting that the process name is listed as 'system', or by following the the instructions using resource monitor and noting that no image is shown having a filehandle open on your file of interest (Although obviously something does as you can't edit/delete etc the file). If that happens, your option (so far as I'm aware) is to restart - or forget about doing anything with that file. I got turned on to the Exteneded Task Manager a while ago by Jeremy Zawodny's blog, and it's great for tracking down further info on processes too. 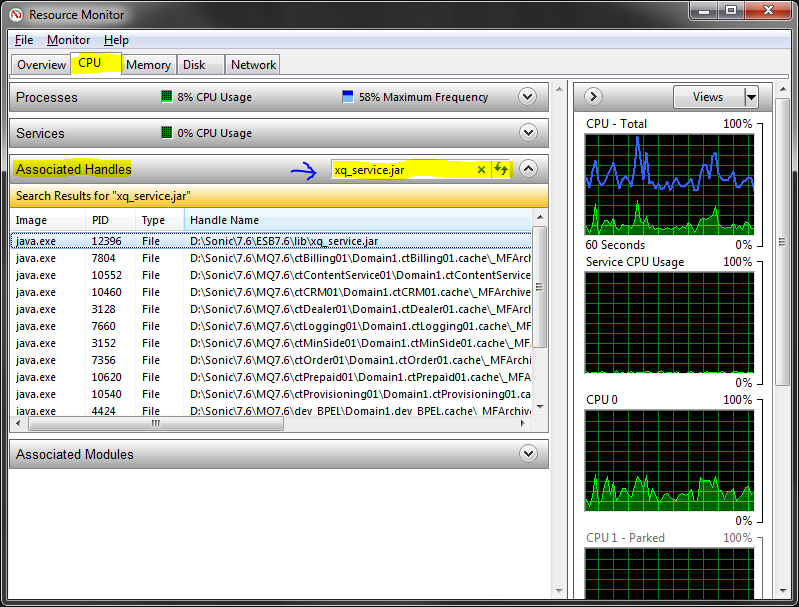 +1 for Process Explorer as above, too, especially for killing processes that the standard Task Manager won't end. Not the answer you're looking for? Browse other questions tagged windows file-sharing or ask your own question. How to removed server file/folder? Why does my disk drive access slow so much after adding a new drive? How do you add a Windows environment variable without rebooting? In Windows, using the command line, how do you check if a remote port is open? how to prevent windows server 2016 share from holding file locks after a disconnects?